A strange spiral structure was discovered by astronomers around a red giant star. 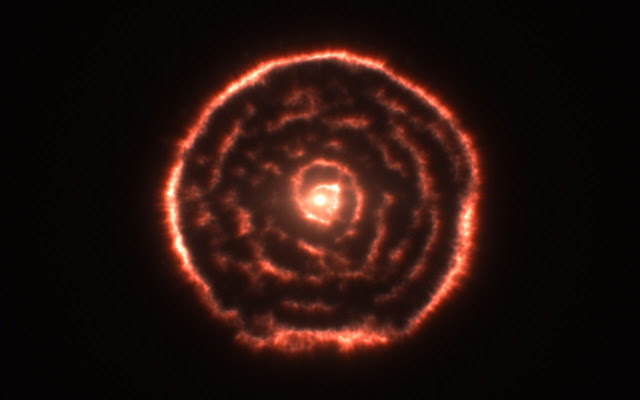 Using the Atacama Large Millimeter/submillimeter Array (ALMA) telescope, astronomers discovered that R. Sculptoris, an old red giant star, has a surprising spiral structure around it. Astronomers believe that this structure is ejected material from the star. It forms the surprising spiral shape because of another companion star orbiting R Sculptoris. The orbit of the star may influence stellar winds shaping the material into the spiral structure discovered. Astronomers have yet to discover this unseen companion star. Although strange, red giants eject hot material later in its life. These materials are made up of dust and gasses that later on form into other stars, planets, and other interstellar objects. Initially, these materials form a gas and dust cloud in outer space called a nebula/nebulae. The imaging telescope used is the ALMA. It is the most powerful telescope in the world. It covers sixteen kilometers of 66 high-precision antennas high up in the Chajnantor plateau in the Chilean Andes. Using light wavelengths between infrared light and radio waves, the telescope can detect light from cold objects at near absolute zero temperatures in space. Usually, the light emitted is not detected by standard telescopes but since ALMA works in the what is called the millimeter/submillimeter radiation, it can be imaged. Objects such as gas and dust clouds in space are often the target by ALMA since these areas are dark, cold and obscured by visible light. Astronomers using the Atacama Large Millimeter/submillimeter Array (ALMA) have discovered a totally unexpected spiral structure in the material around the old star R Sculptoris. This is the first time that such a structure, along with an outer spherical shell, has been found around a red giant star. It is also the first time that astronomers could get full three-dimensional information about such a spiral. The strange shape was probably created by a hidden companion star orbiting the red giant. This work is one of the first ALMA early science results to be published and it appears in the journal Nature this week. A team using the Atacama Large Millimeter/submillimeter Array (ALMA), the most powerful millimetre/submillimetre telescope in the world, has discovered a surprising spiral structure in the gas around the red giant star R Sculptoris . This means that there is probably a previously unseen companion star orbiting the star . The astronomers were also surprised to find that far more material than expected had been ejected by the red giant. “We’ve seen shells around this kind of star before, but this is the first time we’ve ever seen a spiral of material coming out from a star, together with a surrounding shell,” says the lead author on the paper presenting the results, Matthias Maercker (ESO and Argelander Institute for Astronomy, University of Bonn, Germany). In order to describe the observed structure around R Sculptoris, the team of astronomers has also performed computer simulations to follow the evolution of a binary system . These models fit the new ALMA observations very well. "It’s a real challenge to describe theoretically all the observed details coming from ALMA, but our computer models show that we really are on the right track. ALMA is giving us new insight into what's happening in these stars and what might happen to the Sun in a few billion years from now," says Shazrene Mohamed (Argelander Institute for Astronomy, Bonn, Germany and South African Astronomical Observatory), a co-author of the study. “In the near future, observations of stars like R Sculptoris with ALMA will help us to understand how the elements we are made up of reached places like the Earth. They also give us a hint of what our own star's far future might be like,” concludes Matthias Maercker. R Sculptoris is an example of an asymptotic giant branch (AGB) star. These are stars with initial masses between 0.8 and 8 solar masses in the late stages of their lives. They are cool, red giants with large mass loss in the form of strong stellar winds, and are typically long-period variables. Their structure consists of a tiny central core of carbon and oxygen surrounded by a helium and hydrogen burning shell, and then an enormous convective envelope. The Sun will eventually evolve into an AGB star. The ejected shell formed around AGB stars is composed of gas and dust grains. The dust grains can be spotted by looking for thermal emission extending from the far infrared through millimetre wavelengths. At millimetre wavelengths emission from the CO molecule allows astronomers to obtain high-resolution maps of the gas emission from the strong stellar wind generated by the AGB stars. These observations are also excellent tracers of the gas distribution around these objects. The high sensitivity of ALMA makes it possible to directly image the dust condensation zone and the structure of the material around AGB stars, showing details smaller than 0.1 arcsecond. A similar spiral, but without a surrounding shell, has been seen in NASA/ESA Hubble Space Telescope observations of the star LL Pegasi. But, unlike the new ALMA observations, these data did not allow the full three-dimensional structure to be studied. The Hubble observations detect the dust and ALMA the molecular emission. Unseen binaries have also been suggested as an explanation for the odd shapes seen in related objects, planetary nebulae. After the AGB phase, intermediate and low-mass stars (0.8–8 solar masses) will end their lives by forming a planetary nebula. These are the glowing remains of the stellar envelope of gas ejected during the AGB phase, which is ionised by ultraviolet radiation emitted by the central star. Many planetary nebulae have extremely complex and varied morphologies. Binary central stars, stellar discs and magnetic fields have been suggested as the mechanism that produces such a variety of shapes. The system modelled here consists of a primary AGB star going through a thermal pulse and a small companion star. The separation between the stars used in the simulation is 60 astronomical units with a total mass of the system of two solar masses. The orbital period is 350 years.